What can 21st century educators learn from the example of a 19th century president? 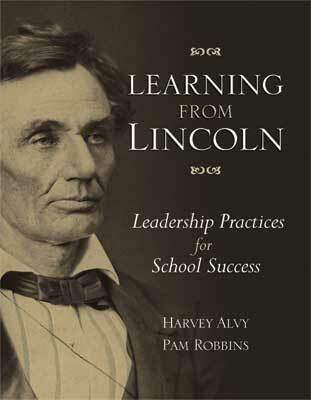 In this intriguing and insightful book, Harvey Alvy and Pam Robbins show how the legacy of Abraham Lincoln can guide today’s education leaders—principals, teachers, superintendents, and others—as they tackle large-scale challenges, such as closing the achievement gap, and everyday issues, such as communicating with constituents. Chapters devoted to each element explore the historical record of Lincoln’s life and actions, then discuss the implications for modern educators. End-of-chapter exercises provide a structure for reflection, analysis of current behaviors, and guidance for future work, so that readers can create their own path to success—inspired by the example of one of the greatest leaders of all time. This is a Premium member book. HARVEY ALVY served as a practicing principal for 14 years, gaining both elementary and secondary administrative experience. His teaching career began as an inner-city elementary school teacher in New York City. Alvy later taught in middle and high schools in the United States and abroad. His experience in multicultural international schools is extensive and includes the American School in Kinshasa, Zaire; the American International School in Israel; the American Embassy School in New Delhi, India; and Singapore American School. PAM ROBBINS is an independent consultant who works with school systems, state departments of education, universities, professional organizations, and corporate clients across the United States, Canada, Europe, Great Britain, South America, and Asia. Her professional background includes work as a special and regular education teacher, a high school basketball coach, Director of Staff Development, Special Projects and Research for the Napa County Office of Education, and Director of Training for the North Bay California School Leadership Academy.